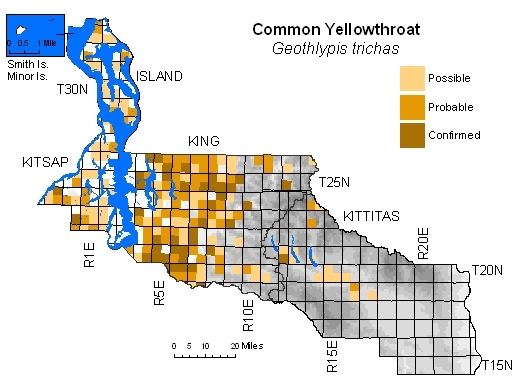 Common in open wetlands at lower elevations in King, Kitsap, and Island Counties, but also penetrates to higher elevation along streams in eastern King County, occasionally reaching highest passes. 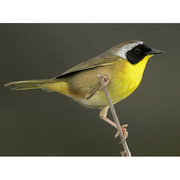 Uncommon and local breeder at moderate elevation in Kittitas County in ponds and wetlands along Yakima River and tributaries from vicinity of Thorp west to Keechelus Lake, and north along Cle Elum River to fairly high elevation. Prefers cattail habitat, but in western counties may use drier, open habitats dominated by invasive plants. Absent from Columbia Plateau, where little, if any, appropriate habitat occurs.